Full Throttle Media to Redesign Production Process for "In the Spread"
Full Throttle Media's innovative project In the Spread prepares to launch a new production framework and a very interesting new set for in studio segments. 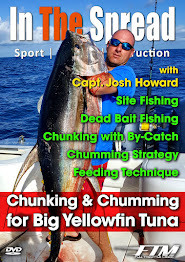 Following the dredge fishing video featuring Captain Glenn Cameron, RJ Boyle and Full Throttle Media made the decision to revamp the production process to streamline the process for all future videos. The goal behind this new approach is to shorten the production schedule, so we can get more videos to market sooner. This will provide a very engaging environment for the viewer and serve to creatively integrate our sponsors. Photos of the new sets buildout will be released as the construction process begins. Stay tuned! As 2013 commences, Full Throttle Media prepares for a busy schedule that has it filming projects all the way in to the fall. Starting next week, the production team will begin filming four videos for the In the Spread instructional series. With two DVD's on the market, two coming to market in the first quarter, the four to be shot next week will make eight videos for In the Spread. A further sixteen are slated for production later this year. There are also a couple of yet to be disclosed productions in planning. So, we have a lot on our minds. With fingers crossed, we roll on. This will be a BIG year for Full Throttle Media. The team is excited and gunning for a big splash with our digital distribution platform, which should be online by the first of April. Stay tuned for more announcements and releases.